If you are in looking for a copier or printer in the Daytona Beach area, please come by our showroom at the base of the Seabreeze bridge in Daytona Beach. We carry a broad range of copiers, printers and scanners, to fit nearly any copying, printing and scanning needs. And best of all, our copiers printers and scanners are refurbished right here in the shop located behind our showroom, so we guarantee the equipment will meet all factory specifications, and will work just as well as a new copier or printer, and at a fraction of the cost. Looking for a New Copier or Printer? We are proud to announce we are certified dealers of Muratec multi-function printers/copiers. 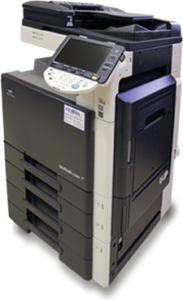 We also carry new Konica Minolta printer/copiers. Our new machines promise years of trouble free service at a low cost per page in color or black and white. Looking to save a little money on a printer/copier? Consider one of our refurbished machines. Many businesses opt for a new copier and printer leases from the manufacturer, as a part of the terms of their lease, they receive a new copier or printer every few years. Often there is little or nothing wrong with the machine they are replacing. 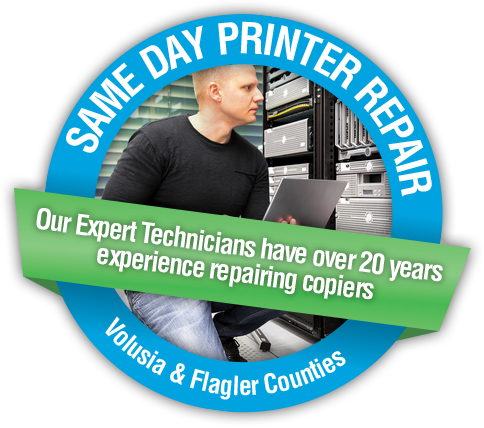 We buy those copiers and printers, give them a thorough inspection, replace any necessary parts and clean them up to the point that they often look like new. When we purchase our equipment, we purchase only industrial grade products. What that means is you can expect 6-8 years of useful life out of the copier. We have customers that have has their copiers for over 10 years. And just to be clear, these were machines that we bought, refurbished in our shop, put in their businesses and were serviced regularly as a part of our service contract. Consider this, for most inkjet on the market, the cost of printing is around 20 cents per page, our copiers cut that to under a penny (black and white). Our service contract is a “Bumper-to-Bumper” plan, and covers everything but the paper. That means it covers regular service, repair service, parts, labor and toner. We pride ourselves on the speed of our response to service requests. Last year, our average response time was 2.8 hours. So from the time that someone called and requested one of our copier techs to come out and service their copier. There was a technician there doing the work in under three hours.